"Music & Stories: The Elixir of Life"
Tara Mondou, along with her friend and fellow author, Debby Spitzig founded Cambridge Authors; a group of talented writers and published authors who had experienced the frustration that sometimes comes with the difficult world of publishing and marketing. Both women are published authors themselves, and recognized that there was a gap in their community with regards to finding intel on how to navigate these troublesome waters—so they formed a group that consists of about 25 members who meet on a monthly basis at their favourite watering hole. The group works to support each other and to offer positive advice and tried and true solutions to their challenges. 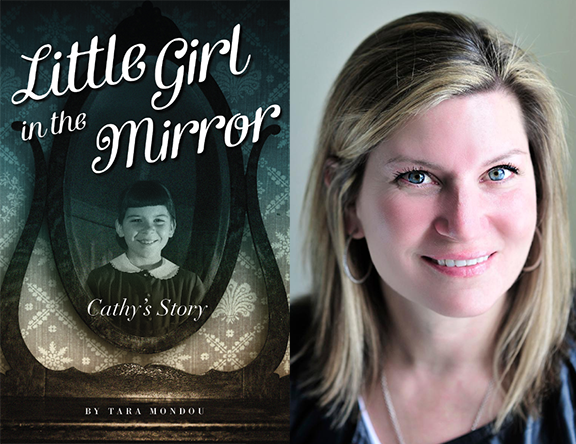 "Our goal for the Cambridge Authors has always been to provide them with event opportunities to present their work to the public; the more opportunities they have, the more they feel comfortable talking about and promoting their books," said Tara. Tara has recently combined her life-long passion for writing and telling stories with her new-found love for Canadian music and books that tell the story of the Toronto music scene and its age-old history. So shortly after reading "The Legendary Horseshoe Tavern: A Complete History", she knew she wanted to partner with the author himself, David McPherson. "We met at a Skydiggers concert, and soon after that, ran into each other at a Ron Sexsmith event at the KPL and shortly afterwards at another event with Tom Wilson." "I knew I wanted to do something bigger and better than the last few events I’d done, so the idea of David and I bringing local musicians, artists, and authors together in one of the most unique, newly renovated spaces in Cambridge—Idea Exchange the Old Post Office—made me feel like we were bringing Cambridge Authors to a whole new level," said Tara. But Tara understands that taking on a large event like this would mean tapping into her community-building spirit and connecting with like-minded people in her network. 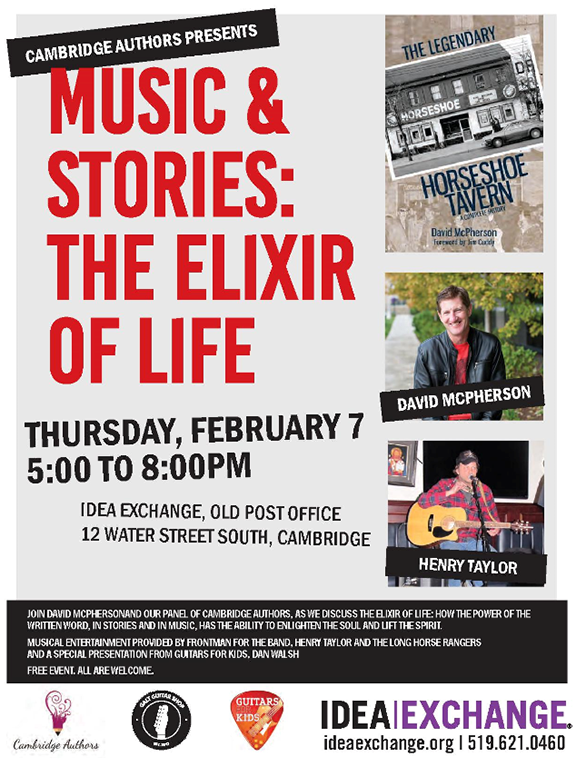 Enter musician, Henry Taylor, who will be singing and playing guitar for the guests at the Feb 7 event titled "Music & Stories: The Elixir of Life", add in support from Guitars for Kids', Dan Walsh; Galt Guitar Shop owner, Rob Swift; photographer extraordinaire, Brian Duggan; and a panel of talented local authors like Bob Burtt, Telma Rocha and Autumn Fernandes, who will be accompanied by several members from Cambridge Authors. The event’s line-up of talented guests will ensure their audience will agree that music and stories really is the “Elixir of Life”. "You need to get help from your friends; you need to figure out how to help them help you," added Tara. "Supporting local artistic talent, and businesses and organizations like Idea Exchange, who provide space and facilitation—helps put groups like Cambridge Authors on the map."